Anyone with a hobby needs to learn how to separate their ‘want’ items from their ‘must have’ items to avoid going broke. The same is absolutely true about guns. So are you combat ready? Not without the Eclan SpecterDR. You can spend thousands of dollars on a single piece of kit. It will probably be one of the coolest things you own, but still, we’re talking about thousands of dollars. High-end scopes are tempting because they offer features and vision that truly can’t be beaten. They’re definitely collectors’ items, and they make amateurs feel a bit more professional. You can’t put a price on that. By now, you’ve probably thought of just such a scope – and it’s probably a Leupold, which make some of the best scopes in the business. But we want to talk about a different brand: Elcan. 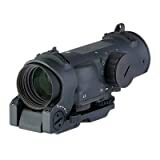 Elcan produces high-end military optics. If you’ve heard of them, your source was probably a buddy in the Special Forces, where Elcan scopes aren’t just mandatory but indispensable. But if you’ve got the time and the money, you can own this incredible scope for yourself. But is it worth it? What’s even a rifle scope for? We’ll review the Elcan SpecterDR to find out whether this single dream scope is worth the price of five inferior scopes. What is Elcan SpecterDR and How Does It Work? The Elcan M145 is the best-known optic from Eclan, but the scope’s use is limited to machine guns and assault rifles. For those who want something a bit more versatile and modern, we recommend the Elcan SpecterDR. Compared to other scopes, it’s heavy and expensive (we mean really expensive). Still, there’s something there because it’s loved by those who need accuracy and efficiency most – the military. How does it stack up against its competition? Let’s find out. Huge field of vision giving competition and combat shooters a magnified sight picture without limiting peripheral vision and awareness. Elcan doesn’t have the brand name power that other accessories brands have, but that’s in part why we love it. It’s lack of appeal as a household name isn’t a reflection of its capabilities or popularity. Instead, the company just doesn’t worry about public perception and focuses on what matters most: performance. If you haven’t heard of Elcan, don’t worry. It’s not new or unestablished. In fact, Elcan has a very high profile among the Canadian, Danish, Dutch, and Norwegian militaries, who all order Elcan optics for their troops. Everything here suggests high-end optics. You may find the reticle a bit busy for your taste, but newer models do include a simpler option. Still, you’ll find the reticle is at its best when you’re making 500-750-yard shots at a 4x scope: while the clarity of the glass is essential, the BDC reticle makes all the difference in helping you find the proper holdover. You’ll also notice that the scope is heavy – really heavy. There’s no explaining the extraordinary weight, but you can be sure that it is very durable, so that likely plays at least a minor role in the weight. Finally, the magnification is often read as 1-4x as in offering magnification settings between one to four. This is not the case: you have the option between 1 or 4x. However, there’s a lever included that makes the transition seamless. Use the level to flip between the two without missing a beat. The lever is one of the coolest features on the scope. Inside the box, you’ll get the scope, an instruction manual, and a battery. Word on the street says that the packaging is lackluster, so if yours arrives in a plain brown box, you’re in good company. There’s little security bar some light cardboard, so it’s probably a good idea to opt for secured shipping. Sure, it’s robust, but shipping companies can do serious damage to products regardless. The last thing you need is a broken $2000+ scope. Otherwise, set up is easy as long as you follow the instructions. It’s simple to fit it to many common rifles and even a machine gun if that’s your thing. One thing to note about set-up is the weight. When you’re looking at it online, 23 ounces sounds fine because the features are fantastic. However, you’ll notice the weight if you have to hike it somewhere. Plus, the ARMS mount adds even more weight to the scope. So be wary if you like to be on the move for long periods of time. A versatile scope like this one should perform perfectly at multiple distances, but is this the case? After all, you’ve got a very limited magnification range (1-4x), so surely your field of vision should be limited, too. At 25 yards and 1x magnification, you’ll be treated to a high-quality picture. It’s bright, clear, and it really hits home how powerful a 1x can be. 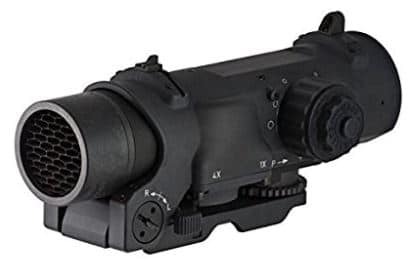 The biggest thing to note is that the excellence in the picture isn’t just in the center or at the target – it extends through the whole picture, which differentiates it significantly from other scopes like the ACOG. 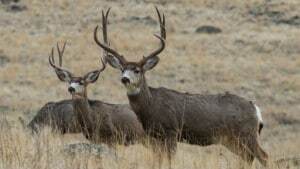 It’s a dream at 25 yards, but what about 100 yards or 400 yards? When you’re lining up a 400-yard shot with a magnification of 4x, you’ll get the same sort of picture. Some suggest that the instant change is so accurate that you’ll have to try to miss. 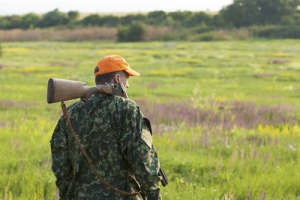 Though, knowledge of your rifle and load will always help you use the scope most efficiently. The optic is good for around 500 yards, but it’s not a long-distance scope, so excessive ballistics knowledge of every rifle you try it on isn’t wholly necessary. Finally, how does it stand up to a few hundred rounds? 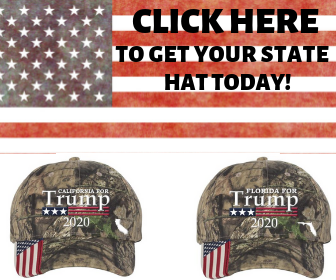 As far as we can tell, you’ll need to hit the high hundreds and early thousands before the reticle moves away from zero or the picture suffers. Even after 500 rounds, Elcan SpecterDR operates like it was just installed. The Elcan SpecterDR is suitable for plenty of guns, but its usage is limited to short and medium-range applications. Self-defense and home use are standard applications. If you’re a competitor, you will use it for three-gun competitions. Bring it out hunting for close-range hunting. Think of it as the swiss army knife of optics. It has loads of applications for nearby shots. But don’t go trying to cut down a tree with it. Elcan itself likes to note that the scope offers enough practical uses that you’d need two scopes to do the same thing without it. We think it’s a great point: one scope to rule them all (and save on weight). You’ll struggle to find an optic this strong for close range shooting elsewhere on the market. However, you’ll also struggle to find one this expensive as well. You’ll find scopes that do the job at a far lower price point, but you won’t have quite as much fun with them. There are three things that make it unique compared to other products in Elcan’s own range. First, it fits a staggering range of guns including machine guns. What’s more, the performance doesn’t suffer when switching guns. While other scopes are designed specifically for AR15s or .22 rifles, you’ll get a lot of enjoyment out of this no matter where you attach it. It’s also good for multiple uses, which is also difficult to find. In use, the main selling point is the field of view. Scopes at all price points focus on the target area picture first, and there’s a reason for that. 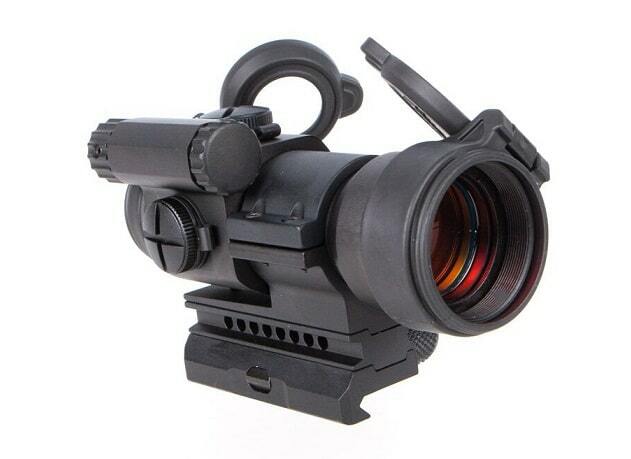 However, being able to see every corner of your field of view with the same clarity and brightness as the target makes the rifle is exceptional, which improves even further on the multiple uses aspect because it’s good in all kinds of conditions. The field of vision really is the unique selling point. It’s also probably why you might casually spot some Special Forces members walking around with them. The Elcan SpecterDR rings in at around $2,100. It’s a professional grade scope for professional uses. But the price isn’t far off its competitors. 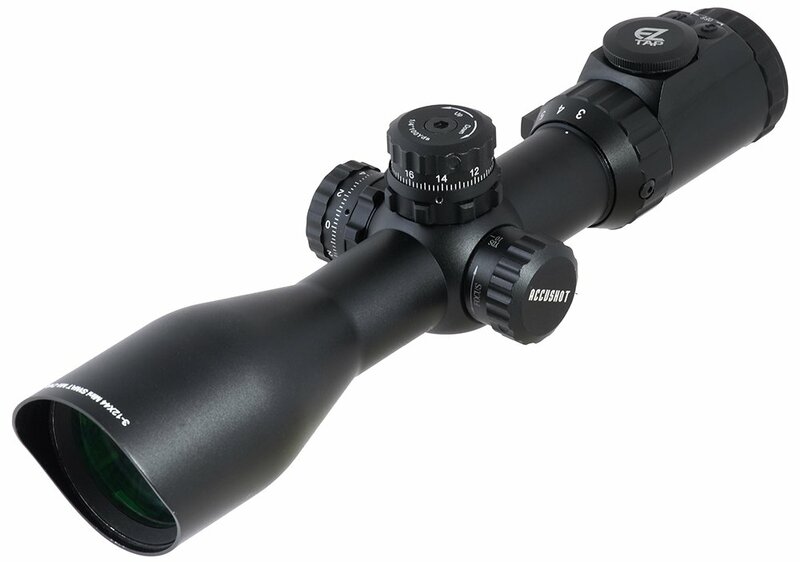 The next closest scope is the Mark 4 HAMR 4x24 mm with DeltaPoint, and it would set you back just south of $2,000. (The Mark 4 HAMR is no longer available for purchase). You can find short and medium-range scopes for a fraction of the price, but none of them will amaze you. On the other hand if you're keen on considering long-range scopes, then read on our review of the best long range scopes under $1000. The Elcan Specter DR is a professional scope. It’s beloved by Special Forces types with specific operational requirements. No one is out buying a $2,000 scope just for shooting raccoons – well, there’s always one. Public perception of the scope recognizes that it’s a professional-grade scope made for the front lines, but a few comments stand out. The Elcan SpecterDR as being a very durable scope – the kind you can run over without shattering. Durability isn’t something we’re normally worried about with a scope because a $100 scope is easily replaced. For $2,000, we expect it to become a family heirloom. Everything from the body to the knobs and lever is heavy-duty and ready to work. The whole thing is drawn together through a combination of basic and stable construction with precision in the essential areas, like the magnification lever. Because the controls are outside the body of the scope, you don’t have to fiddle around with the internal components. The field of vision is majestically large even at 4x. 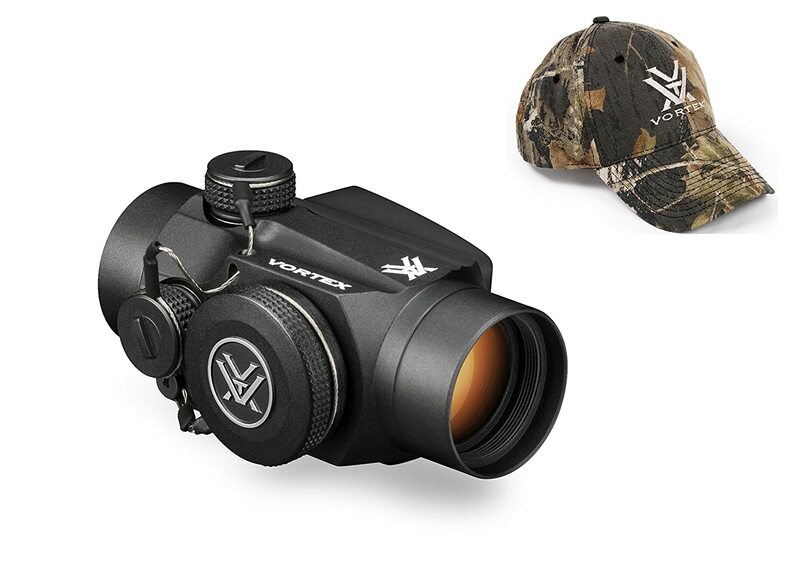 With a field of vision ranging between 34.2 feet at 4x and 146.3 feet at zero, you’ll never be lost. 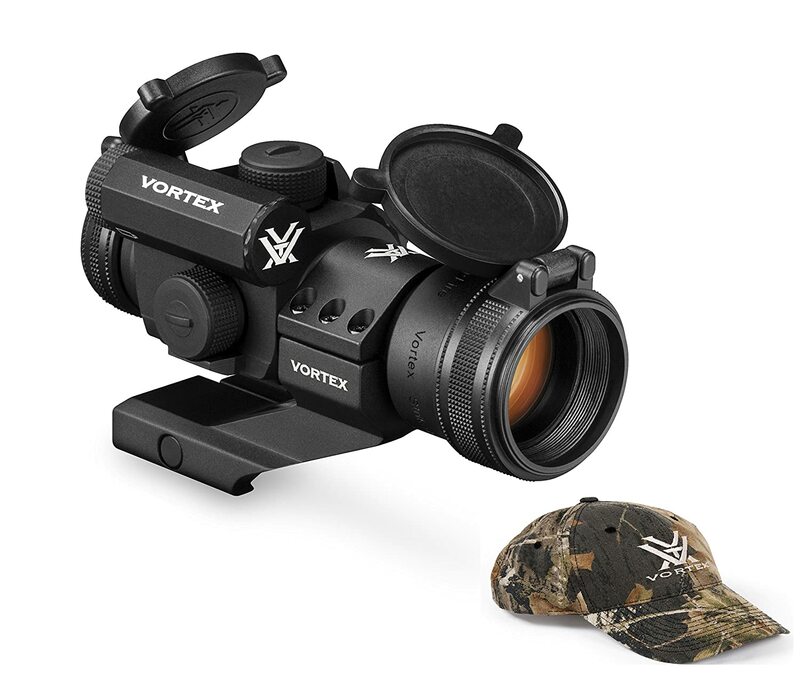 It truly shows off the scope’s usability because the extended field of vision helps when your stalking prey, but it also gives a magnified view without damaging your situational awareness. One of the best-loved features on this scope is that it switches from a 1x setting to a 4x setting without missing a beat. It achieves this through the use of the throw lever that switches between the two bookend settings instantaneously. Even if you have no practical application for using it, it’s still very cool to look at. The battery is a point of complaint because it’s an uncommon battery with 600 hours of charge. But because the reticle is etched into the glass, you’re not out of luck if your battery runs out and you don’t have the backup. The other features won’t do you much good, but you’ll still have the sight. While the field of vision is massive, some people complain about the narrow viewing angle of the scope. If you have this complaint, you might also find the eye box to be too small. The narrow viewing angle is a deal breaker for some: there’s no point in using a scope you can’t see into. Compared to like scopes, the Elcan Specter DR offers a different value proposition. The objective lens on the Specter DR (32 mm) is far bigger than on comparative Leupold models (24 mm). 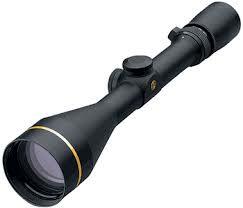 It’s also significantly longer and heavier than most scopes on the market including Leupold models. You might be inclined to think they charge by the ounce, but it’s not true. 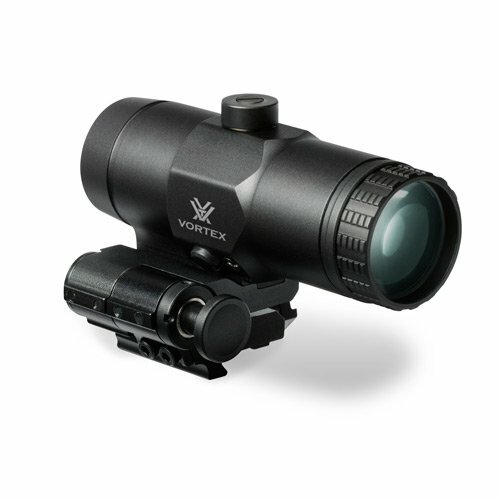 Overall, the optics and glass are better on this scope compared to almost every other available product on the market. The main competitors are equally priced, and one model is no longer available. If you’ve got a use for it or the cash to pay for it, you’ll love this scope. However, it’s not a necessary item outside of combat zones, which is where you’ll make the most of the features like the field of vision. You can get a perfectly suitable scope for a far more enticing price. However, if you can afford it and you’re ready to be amazed, then you’ll get every penny’s worth of your investment in the Elcan Specter DR. Indeed Elcan SpecterDR is on the high-end. 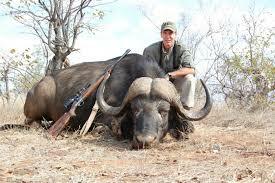 On the other hand, you can use our reviews of rifle scopes for hunting and non-military purposes. We recommend you to first read our rifle scope buying guide though.